The other night I was talking to a girlfriend of mine over dinner about the films we LOVE. These are the movies we can't live without- the ones we watch over and over, recommend...okay, push on everyone in our lives, and instantly bond over when we meet someone else who loves it too. And of course, once we started comparing our lists were totally different. Mine was comprised of a very random assortment and hers were more in the 80s Brat Pack vein. A few from my line up: American History X, Good Will Hunting, Troop Beverly Hills, Rosemary's Baby, Death Becomes Her, and a favorite from my childhood, National Velvet with Elizabeth Taylor. After we both listed out our favorites, our conversation steered to movies that we feel are must-sees that we've never actually seen. I had six right off the bat that friends have recommended to me for ages but just never actually watched, even though I meant to. Have you seen any of these? Okay, so what are yours? Do you have any movies on your "must-see" list that you still haven't gotten around to watching? I have a similar running list in my head of television series I want to eventually watch (Boardwalk Empire, Dexter, Breaking Bad...) but I'm planning on carving out some time to start with these six films over the next couple of month first. Exciting! Gone With the Wind is my absolute most favorite movie!! If we ever have a daughter we want to name her Scarlett after the main character (and also because my boyfriend has a crush on Scarlett Johansson). It's long, so be prepared to spend a whole night on it- totally worth it though! We're big movie lovers at our house, so we've seen A LOT of movies, but now with kids it seems like it's so hard to keep up with all the latest movies... like all of the Oscar nominated films, it seems. Who knows how long it'll take before I actually see any of them. :p There are a ton of TV shows I've never seen either. 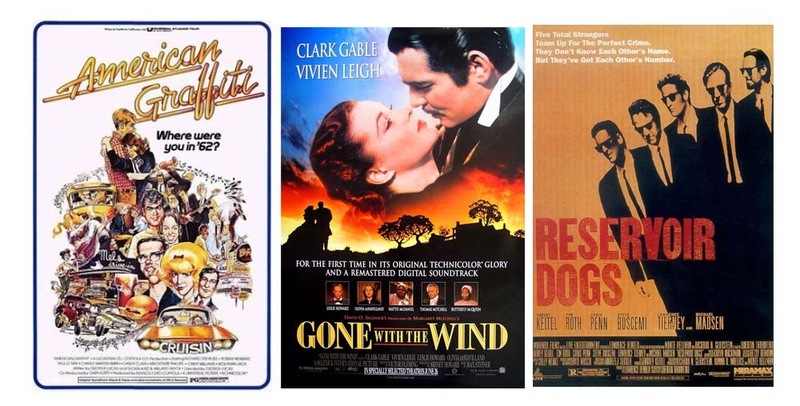 Gone with the wind is one of my favorite. and reservoir dogs is pure awesomeness! i'm embarrased to say but i still haven't watched the godfather... but only today i mentioned this and said i needed to get to it asap! Well since my name comes from Gone with the Wind it's definitely a favorite. Death Becomes Her is just amazing and I have ALWAYS loved it. Sabrina is one of my all time must see's for anyone. And Beetlejuice is my #1. Also I keep trying to watch "The Heathers" but always seem to start it in bed and therefore fall asleep before the end. Once you watch Annie Hall, you are going to want to watch every movie Woody Allen ever made. He has a way of making the city of New York (and Paris) as another character in his movies. I love the city and love his whit and cinematography. Gone with the wind is one of my all time favorites. SO good. And Breaking Bad...well prepare to say good-bye to weeks of your life. It is crazy addictive. Loved reading this post, since you know I love movies as much as you do! Not surprisingly, I haven't seen any of those must see movies either. Some other ones that are on my list are A White Christmas and The Sound of Music. By the way I still am in shock that you haven't seen Braking Bad yet! I know you will absolutely love it. Yep, I've seen all of these movies. "Annie Hall," "Reservoir Dogs" and "The Godfather" are the cream of that crop. The others you should definitely see at least once. From your list I totally loved Annie Hall, (huge Woody Allen fan) and reservoir dogs which to me its the best from Tarantino! And a must-see I have never seen would be... Titanic! I just never feel like watching it although I would like to see it someday! Top Gun is definietly a great one!! I love going to the movies but far too often I don't make it there! I really have enjoyed discovering red box because the films I want to see and don't get around to doing so I'm able to for a reasonable price without going out to blindly buy it! I am terrible with movies. I have never seen any of those movies, haha. But when it comes to TV, I've probably watched it all. This year I've vowed to get more into movies! I haven't seen The Godfather either (and am always met with horror when I admit this). Haven't seen any of The Rocky's, The Termintor's, LOTR...the list goes on. I think I'm the only person in the world who hasn't seen Casablanca. The Godfather is amazing! And definitely watch Breaking Bad - soooooo good! I saw 'The Godfather' for the first time earlier this year, and all I kept saying to myself the entire time was, "If only they had cell phones." I never get tired of Top Gun! Love that movie. They just took it off Netflix so that's sad... but you should definitely watch it! Top Gun is hilarious in the 80's cheese kind of way. It never gets old! American Graffiti!!! My Great Uncle is Wolfman Jack! He is the radio DJ on the radio the whole time in American Graffiti and he is the guy in the radio station at the end of the movie. My great uncle used to broadcast rock 'n' roll music from Mexico into the United States when it wasn't allowed. American Grafitti is one my father let me watch at age 11. And I have loved retro ever since. Plus, top gun has one if THE BEST movie moments EVER. Great list of must see movies of all time! All movies are of evergreen kind in your list but I would like to say "American Grafitti" is really a wonderful movie that you have suggested here in your blog. I have watched it first time and would love to watch many times ahead too. Thanks for that.